Enjoy being close to the ocean, amazing deck views and a beautifully maintained home at a great price, and spend your vacation enjoying the endless ocean breezes thanks to a semi-oceanfront location. Situated in a cul-de-sac of Sea Hawk in Duck, guests of dreamy Dunestruck are close to all the great town amenities and a nearby beach access that’s only 100 ft. away. 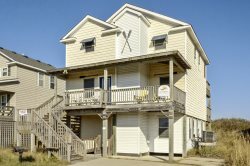 The interior of Dunestruck is spacious and sunny, with four bedrooms, (including two King bedrooms and two bedrooms with Pyramid Bunks), that are outfitted with pretty coastal decor and ample space to relax. The kitchen, living and dining areas are centrally located, and are ideal for stretching out and sharing the day’s adventures. With touches of blue and yellow throughout to evoke a purely coastal atmosphere, and fresh sea breezes that can be enjoyed with every outside venture, Dunestruck is an enticing destination to enjoy life by the sea to its fullest. From the coastal touches of decor to the host of amenities, vacation fun abounds at Dunestruck. Discover how dreamy life in Duck can be, and make a date with this enchanting vacation home today. - There is no public beach or sound access within the Town limits. Access to the sound and Duck's town beaches is limited to residents, renters, and their guests. ALL ON ONE LEVEL: Living area, dining area, kitchen, two King bedrooms, two bedrooms with Pyramid Bunks and 2 full hall bathrooms.Washer and Dryer located under the house. Loved the house and loved the location!